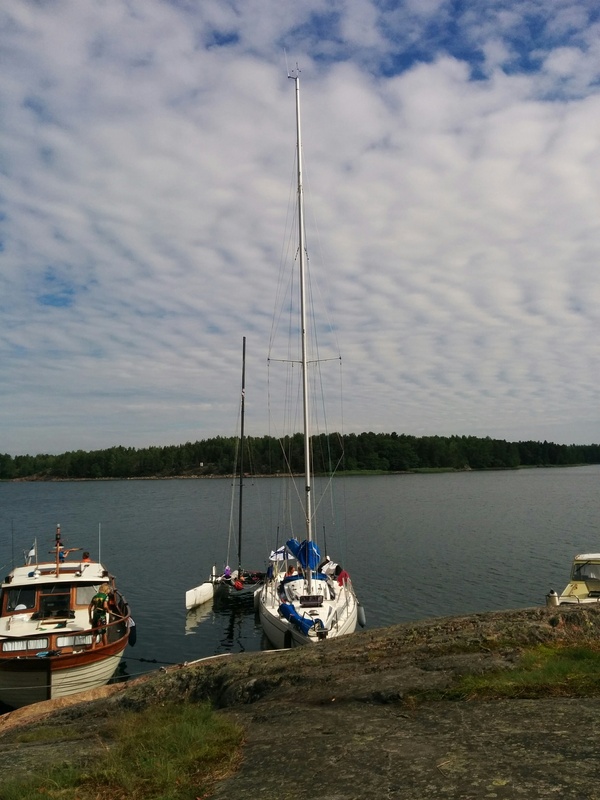 200 nautical miles (370km) upwind in Finland’s rocky but beautiful archipelago in sunshine. 500km north from Ketchikan, AK, which is finishing line for Race To Alaska. 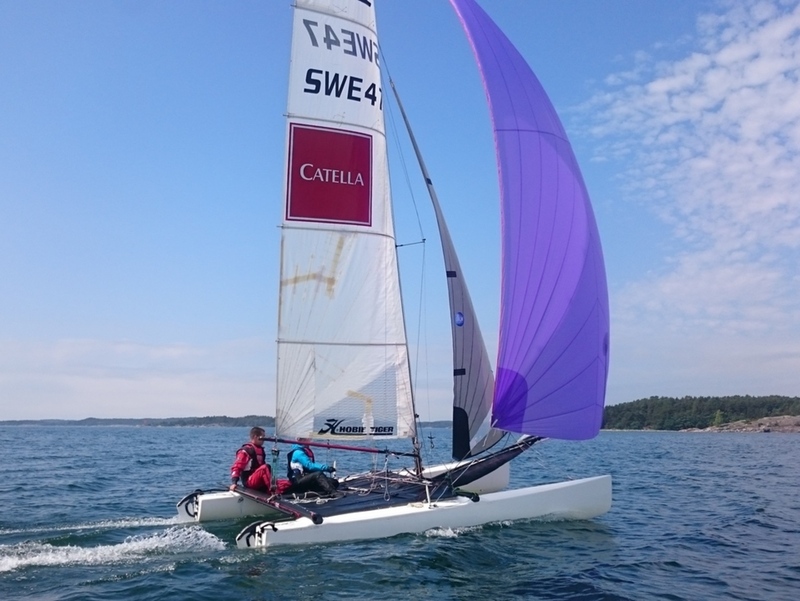 Formula 18, two-person crew, 5.5m long racing catamaran. Pictures. 155 nautical miles through fairways, 203 nautical miles (376km) realized. 9% downwind, 70% upwind, 21% close hauled. Mostly sunny, some rain. On our route over 700 rocks and 150 shallow areas we had to consider when navigating. Over 430 relevant sea markers. 2016-06-28 -- 2016-07-02, five sailing days, 6 stops. 459 tacks, 64 gybes. Sailing for 35 hours. Tens of thousands of underwater rocks, shallow areas, narrow (50m or less (150 feet)) passes between beautiful, rocky islands. Over 20000 islands. Last fall, shortly after we had bought a secondhand Formula 18 racing boat, a crazy idea was born one evening when eating, having fun and going to sauna with our friends: what if, instead of the usual trip to celebrate midsummer on a keelboat from Helsinki to Turku, we’d do the journey on the F18 we’d just purchased? 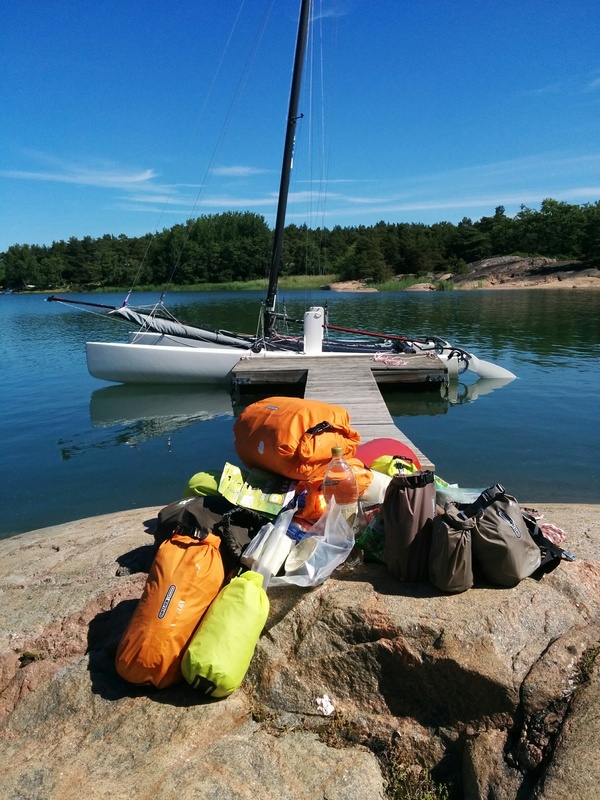 Originally the idea was treated as a funny joke, but in the end it brewed up and became more sensible: the boat would be transported to Turku archipelago by a car on a trailer, and we would sail to Helsinki after midsummer. There were several reasons in favor of this direction: we would certainly get to celebrate midsummer, the prevailing winds would be downwind and our other schedules would not have given in for an early enough departure before midsummer anyway. The boat arrived at Iniö by midsummer and was in use when the weather permitted. 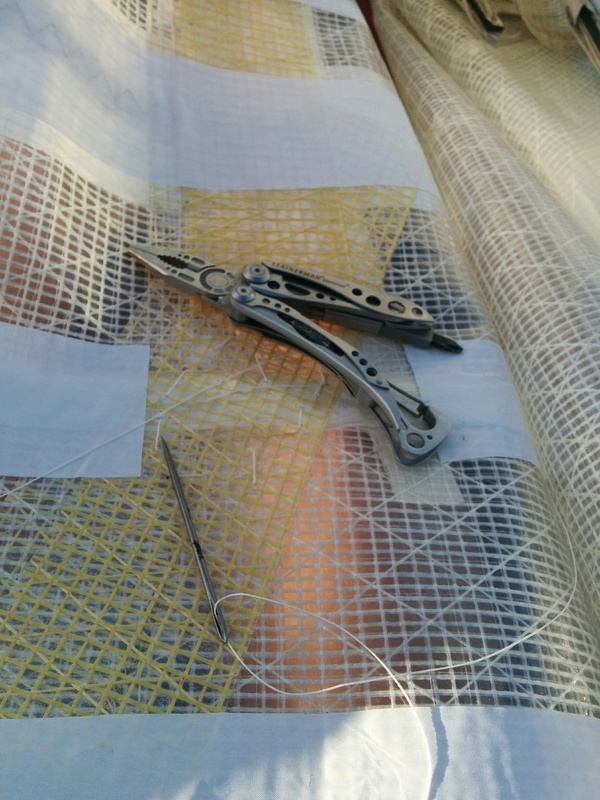 After some capsizing exercises we encountered the first problem: the repairs made to the ten-year-old mainsail with Mylar sail tape had failed. More tape was added already before our journey begun. 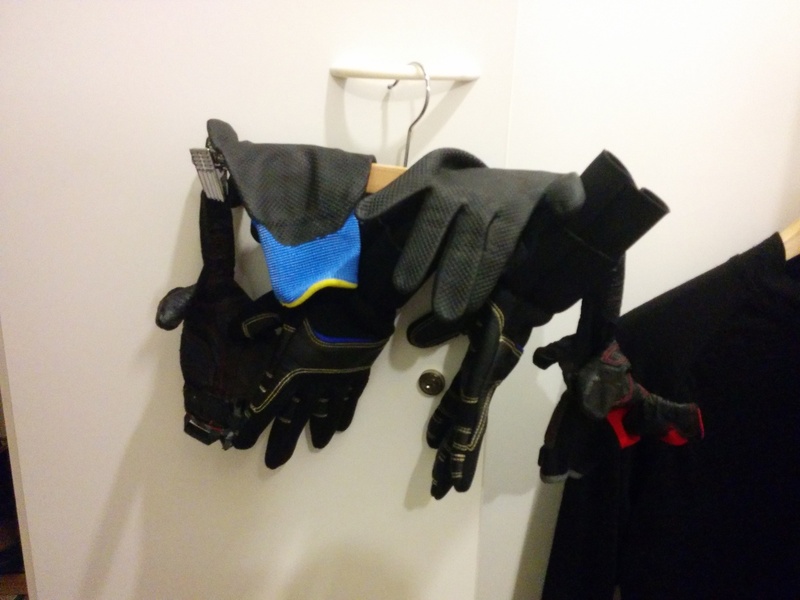 After midsummer we started almost feverish checking for forecasts, waiting and packing. 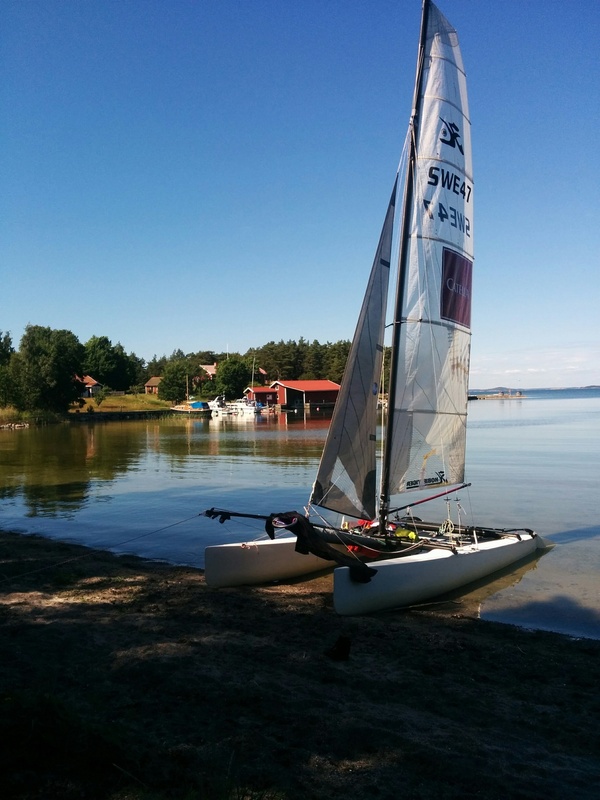 There was a suitable opening without too heavy winds, calm days or thunderstorms, so we set sail on Tuesday. 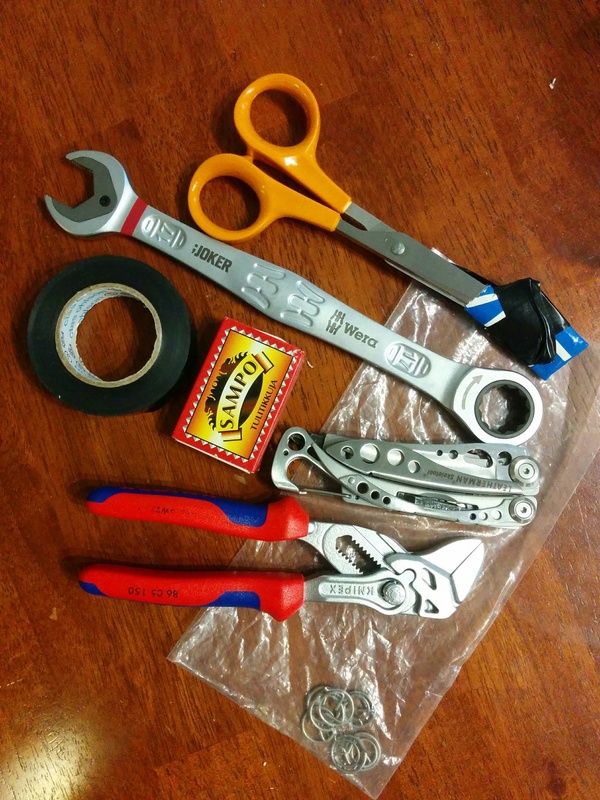 A pile of stuff. Everything except the tent, sleeping bags and one big drysack full of clothes went through 13cm (5.1in) inspection hatches to the hulls. Exact equipment list is here. We started towards Nauvo in sunny weather with good side winds - which promptly turned out to be upwind for almost all the way. 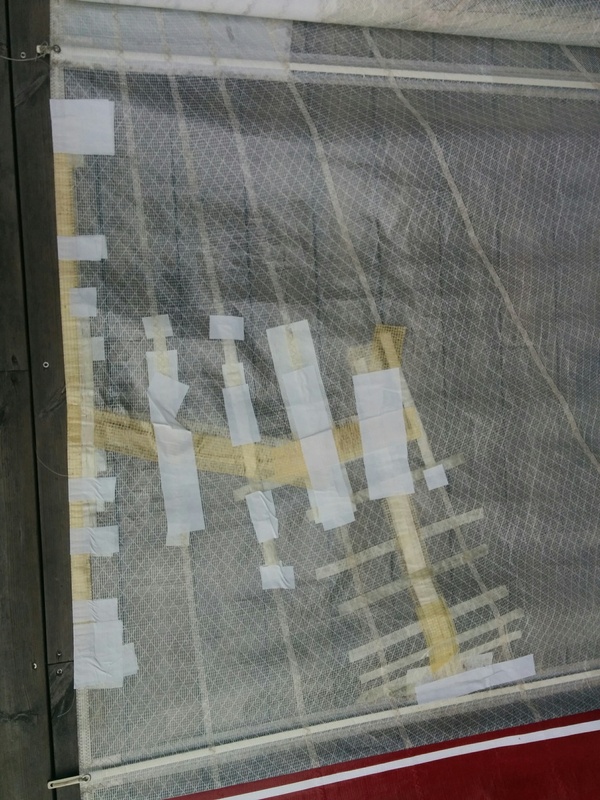 Mainsails taping and other fixes started to break up, and we were afraid we could tear the sail on the first leg. Twenty-five nautical miles to Nauvo took five hours, as the sail wasn’t fully tensioned. After elegant buoy mooring — including swimming to the pier and back — we borrowed sail needle and string, and started to fix the mainsail hopefully for the better. From Nauvo we continued again in sunny weather but upwind towards Helsingholmen and Högsåra. In the west almost all other boaters were friendly, motorboats took extra care not to drive too close (and some even dropped speed so that there were smaller waves) and people waved. Towards the east amount of people waving back decreased and motorboats thinking “I can fit from the front” increased. In Högsåra we were in a hurry to leave — the forecast promised good side winds for Thursday when we had planned to cross the open sea of Hanko (Hangonselkä). It was crucial to sail in good, 5 to 8 m/s (9.7-15.5 knots) winds because the F18 does not have reefs, so you either sail fast or capsize in the stronger winds. From Friday to Sunday the winds would have been so strong the open sea would be too dangerous to cross, and we would have had to wait for the winds to lull a bit. On Thursday morning we departed full of enthusiasm towards Hanko, expecting nice 10-15 knots (5.4-8.1km/h) for speed and side winds. However, the winds were precisely upwind all the way, even though our route turned 90 degrees twice: first we went south with the southern wind, then turned to the east for a longer leg — and wind turned almost exactly at the same time. Finally, when we turned towards the south to go around Hanko, new weather front hit, and the wind turned again to south with 11m/s (21.4kts) winds and 14m/s (27kts) gusts. Bigger sailboat tacking next to us broke their mainsail fittings, and had to continue their journey towards safe harbour with an engine. 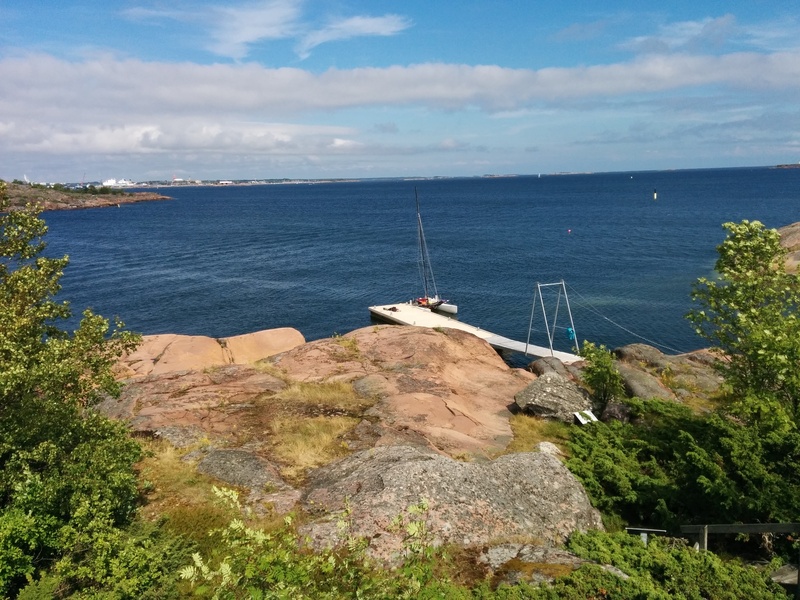 We managed to get to ascetic, rocky but beautiful Tullisaari, right next to Hanko. In Tullisaari we waited for five hours to winds to calm down to something more sensible. We started the second leg towards Byxholmen when the sun started to set. That was the only downwind leg we had, but with 1.5m swell (significant wave height; highest waves were closer to three meters) — we flew our gennaker, and achieved around 10 knots (5.4km/h). We arrived to Byxholmen long after sunset in darkness, and moored to our friend’s boat’s docklines. They had a ready-made dinner, comfortable, warm and dry accommodation in their boat, and much-anticipated sauna. On the next morning everyone slept in, and both boats continued towards Helsinki through different routes. Due to a risk of wind dying mid-leg, we had to choose route closer to the coast, which has a narrow 5 nautical miles (9km) part between Barösund’s tall islands. 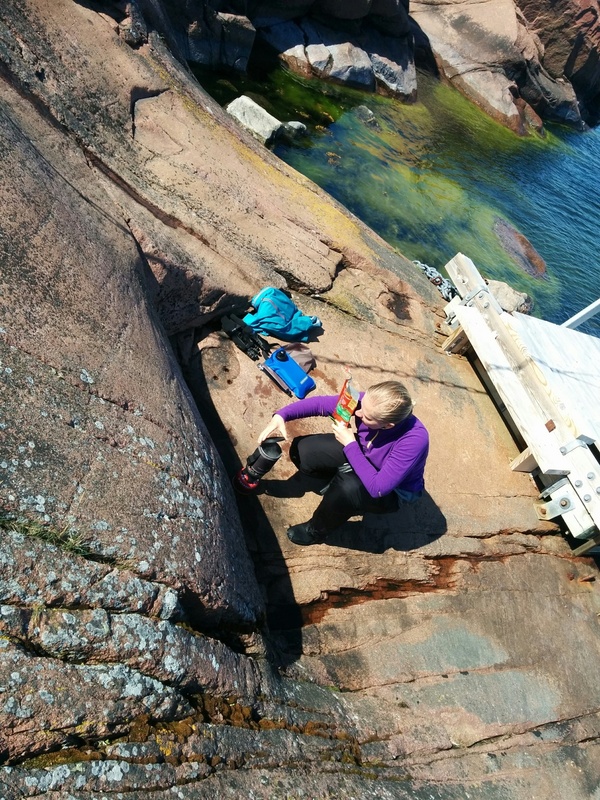 In the narrowest points — when the passage is less than 50 meters wide, with cliffs on both sides — we had to resort to paddling, as there was current against us, and absolutely no wind. 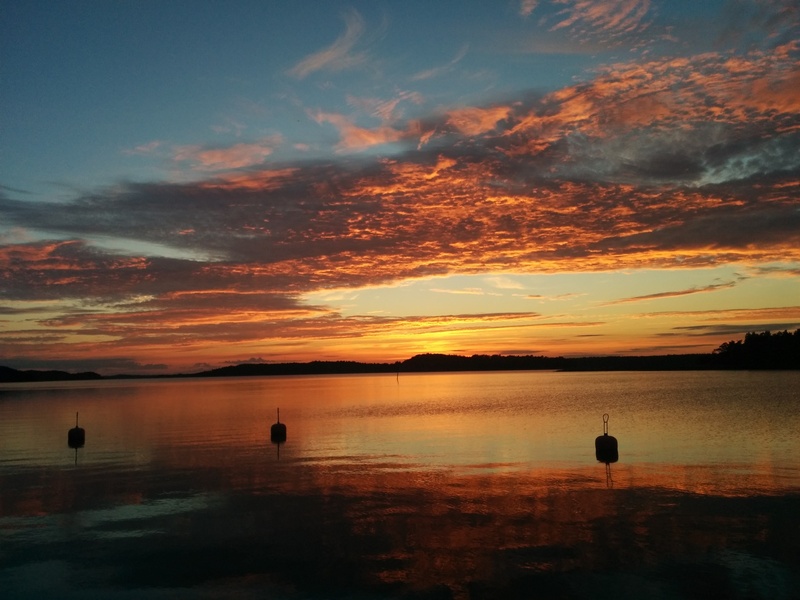 After arriving into Jakobshamn and checking the forecasts, we were delighted to notice that last day’s forecasts were finally for running and broad reach. On the morning bitter truth was revealed — the wind had shifted and our nice broad reach day was tacking all the way to home. 35nm (65km) day turned up to be 53nm (100km), 105 tacks and eight hours without stopping. When we arrived to the harbour, we laughed but at the same time our legs almost gave in from exhaustion. Can’t see the map? Open in a new tab. 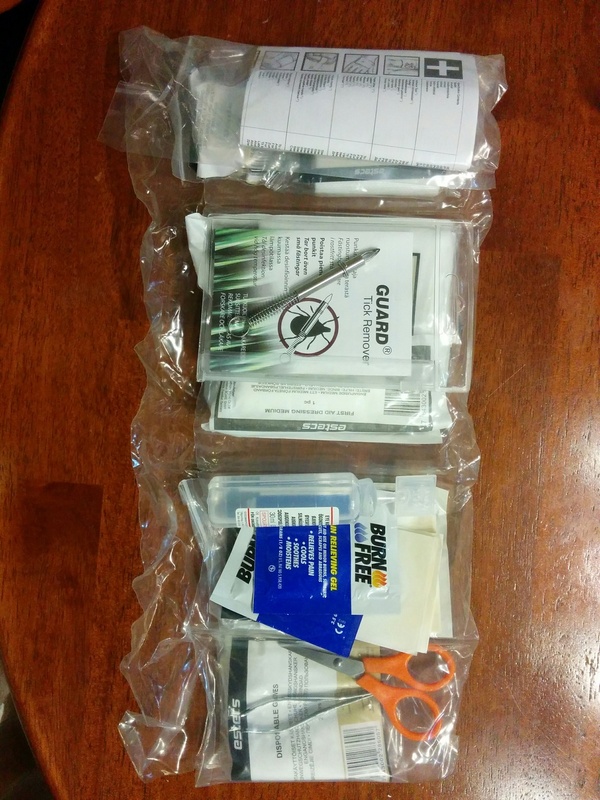 For route planning and as a backup we had laminated copies from printed nautical charts. 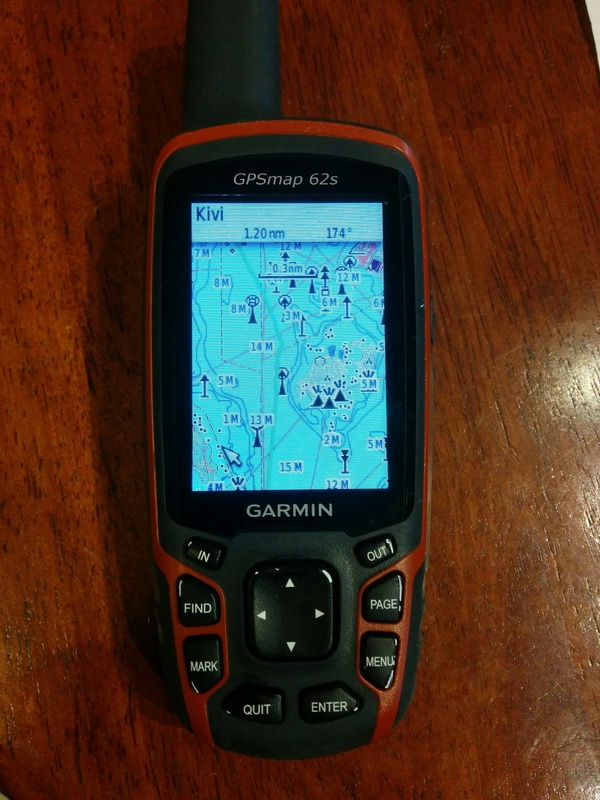 Actual navigation was done with a small handheld GPS with route points entered earlier. It is not possible to side moor to the piers, one must use a buoy. In the bay, north of the harbour, there is a beach, which is in regular use on a sunny weather. Right next to piers there is a small wooden slip for rowing boats and a beach that is quite steep and has some small stones. The are no official camping places (actually camping is prohibited on the headland next to the harbour). We put our tent to a mini park behind the harbour buildings. It is not possible to attach to the piers (except the trash pier) without using an anchor or attaching to a buoy. At the end of the bay there is a long beach, which has scattered rocks, but the water is clear enough to spot them. In south winds it is easy to paddle to the beach shore. Also, there is much terrain for camping, although beware that there are sheep in the island (do not leave your veggies or papers outside the tent!). There is a lot of wooden brim pier to which side mooring is possible. Right next to the harbour is a very shallow and muddy beach, which has some fit sized round rocks in the bottom. The shallow water begins quite shortly after the first buoys. Right next to the beach there is a nice green lawn that is suitable for camping. The pier has a wooden border that is just low enough. Many motorboats navigate the close waterway channel and create waves that rocketed out catamaran just under the wooden border, so it is advisable to monitor your boat when parking here. There are no good places for a tent, which makes sense since camping is prohibited (the island is part of a nature reserve area). Only buoy places, rocks and cliffs everywhere. “Beach" is full of fist-sized rocks. Can’t moor to the side. Multiple buoys (approx 20 meters from the pier). No beach. In front of the restaurant there is a short pier that can be used for side mooring, if there is any room from small motorboats. Staff was very positive about camping, there was enough flat area available. 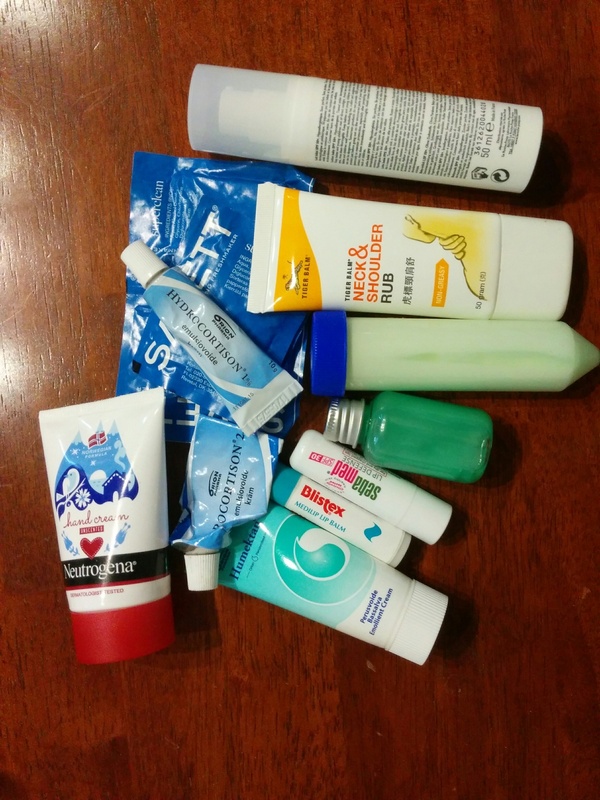 There were two factors that provide challenges to packing: environment (everything gets wet) and the size of lids/holes in the hulls (13cm / 5.1 inches, the hulls themselves do have enough packing space, everything just has to fit through the holes). 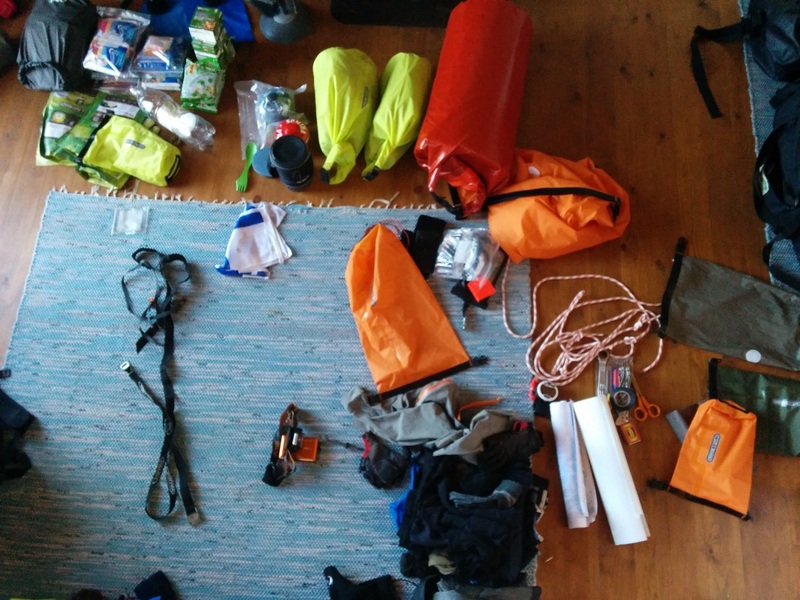 Most of the equipment was chosen on the basis of their size: the majority of our trekking dishes were left home, along with the bigger Primus stove. Only four dry bags were left outside the hulls: one with the tent in it, two with our sleeping bags in them and one with warmer clothes that could be changed when needed. The tent bag was attached to the gennaker pole, others to the trampoline. Share on Facebook, Twitter or Google+. © 2016 Olli and Senja Jarva. Send an email.